Dear Dana: How do I get the spook out of my horse? Most of us have been on a jumpy or spooky horse, one that is ready to jump at anything! In my opinion, it is no fun to ride a horse that is afraid and reactive. Some horses are genuinely more afraid of things than others. They may be more sensitive than others and may notice sights and sounds more acutely than other horses as well, but many horses have learned to be spooky. I feel that often it has become a habit, or a learned behavior. I am going to give you some techniques that will help you to change your horse from a spook into a confident, less reactive horse! Dear Dana: What is a ‘good’ seat and how do I perfect mine? DEAR DANA: I haven’t been riding long, but I am being told I have a good seat — and that I should continue with it. What does that mean? Dear C.A. : When you have a good seat you are able to catch your horse’s rhythm and can “flow” with your horse. Can you picture watching certain riders who look like they are “one with their horse?” They make it look effortless and easy. When your seat improves, you get closer to riding “as one,” and soon you, too, will be able to catch the rhythm and flow with your horse. All you need is some knowledge, a “stick with it” mentality, and a little hard work. Dear Dana: How can I be ‘one with my horse’ and bounce less? DEAR DANA: I have not been riding long and don’t feel like my horse and I are one. I feel like I BOUNCE too much. I see people who are just one with their horse. How can I sit the trot and lope better? Dear Catherine: What a fabulous question! There are many people who need this information, and it is important because how you “sit your horse” is a foundation to becoming a great rider — and to being “one” with your horse! Dear Dana: What will help my reiner keep his head down? DEAR DANA: I have a half-Arab gelding that I want to do reining on. When we stop, his head pops up, and we go bouncing down the arena. What can I do to get him to come under himself and keep his head down? Dear Elizabeth: I can give you some good pointers that will help you and your horse! You need to go back to the fundamentals. If you don’t have the fundamentals, you won’t have the rest of it — and problems like you are describing will pop up! Dear Dana: How do I get the proper arc at the lope? DEAR DANA: I have a 9-year old Quarter Horse-Arab Cross. He’s a very “forward-thinker,” especially at the lope where he tends to drop his inside shoulder and fall in. I’ve always tried to correct this by bringing my inside hand over and up and trying to get him to pick up his shoulder — but I am ALWAYS having to do this. How do I get him to hold himself? Dear Dana: How do I get my horse less fearful in the face? Dear Dana: I have a 4-year-old Quarter Horse gelding that constantly over-bridles and seems very afraid in the face. I’ve tried different bits, and they haven’t changed anything. Often, he will also thrust his head forward and up, pulling the reins from my hands forcefully. I’ve recently started asking him to bring his head around to follow his nose, and it’s helped some — but now he’s becoming heavier in the face. How do I get him to relax in the face? DEAR CALLI: I think it’s possible that much of the problem could be because your horse has developed fear and resistance in the face – most likely from the way a rider used their hands when he was being started, or possibly by the way you use your hands now. This has developed into a very bad habit, and no matter what caused it, you can still benefit and improve by what I’m about to teach you! By developing better feel in your hands you can help your horse to get over this. A horse that reacts by being afraid in the face has not yet learned to have confidence in the rider’s hands. Sometimes this starts by a rider putting too much bit or bridle in a green horse’s mouth. It also may be that the rider may not be sensitive enough in their hands to deal with it. The behaviors of over-bridling or “hiding in the face”, pulling reins out of your hands, and getting “heavy in the face” are all ways that horses use to resist pressure — they show an unhappy and unwilling attitude to pressure in the face or mouth. I would put your horse back into a snaffle or a mild short shank correction-type bit, then and let’s work on rebuilding his confidence. First of all, establish in your mind that it’s OK to take hold of your horse’s face, but also realize that how you approach him with your hands is reminiscent to how you would speak to a person. If your approach is sharp, jerky or rough, then you have “yelled” at him with your hands, and he may be on the defensive. The behaviors you mentioned are defensive behaviors. The biggest thing you can do to change his response is to change your approach to him. 1. Your Approach– This is such an important part, as it is the start the communication with your horse using your hands. Do your best to make sure initial contact is smooth and fair. Don’t come in with a rough or rigid jerk. I teach my riders that it is OK to bump or correct your horse in the face as long as you are in contact. If you jerk or bump with no warning — “out of mid-air,” so to speak — you will scare your horse and teach him to brace against your hands. When you pick up on the reins, just draw up smooth and slow until you are in contact with his mouth and then make any corrections, as needed. 2. Your bump, pull or correction and the follow-through– Once you’ve made contact with your horse’s mouth, you now have to make the decisionas to whether you need to pull or bump your horse in the face or simply just hold him. This is where feel comes into play. Do your best to “feel” with your hands what your horse is doing at the end of the bridle reins – which leads to a point: If your horse is ever pulling the reins out of your hands, he is basically controlling your pull or pick-up. This can reinforce the very bad habit of a horse throwing his head. By allowing him to pull the reins out of your hands, you are giving him a positive reward for his negative behavior, and that will make him do it even more and more! Make sure you are mindful about your hold on the reins, and don’t let those reins slide through your hands! Also, don’t give your horse any stronger correction than is needed to get the desired response. Remember, the pounds of pressure that you use to pull or bump on your horse is intensified or magnified when you use a shank bridle to the degree of severity of the bit. If you are in a snaffle, it is close to the same pounds of pressure as you actually apply with your hands. So ride very mindful of this, and don’t add any more pressure than you need — that will develop trust in your horse. Also, make sure you give a clear message. Riding this way will take a lot of focus, and, for myself, I have found that if I am really working on a horse I must limit my outside distractions or I may get heavy-handed and lose the feel I am trying to develop. You are building a relationship with your horse, so be a fair partner. Follow-through is another important component of this phase of the pick-up. Follow-through is nothing more than asking until you get a response. This also requires feel and awareness. It means to stay in or follow through until you are satisfied with the amount your horse gives. Be clear and give a clear message, and your horse will learn faster. I look for my horse to give in the face but also to soften or lighten in my hands. Then I know I’m ready to release. 3. The release– Once you are satisfied with your horse and the amount that he gave, then you want to release or give back to him with your hands. I like to release in a smooth, slow motion. I also want to recommend that when you release, you are truly released. Make sure you give enough rein so that the pressure(or contact) changed enough so that he truly felt the release. The release is his reward. Horses learn by that reward. They also look for the reward, so make your message clear and make sure he realizes that he is being rewarded. I’ve just given you a lesson on how to use your hands more effectively. If you study that and put it to practice, you will start seeing some good results with all the horses that you ride. Also, a word of warning – as with all horses that you ride, if you are in contact with a horse and their face shows any signs of wanting to rear or becoming dangerous, then stop what you are doing and get the help of a professional. Thanks for your question and happy riding! Do you have a question for Dana? Simply go to www.horsetrader.com and click on the “Dear Dana” section, then submit it! If your question is selected, you will be entered into a monthly drawing for a FREE “Winning Strides” DVD from Dana’s training video series. Dear Dana: What is meant by a horse that can get ‘clutchy’? DEAR DANA: In your DVD, you say the horse can get “clutchy”… could you explain what that means? Is it the movement of the horse? Dear Dana: What should my futurity horse focus be in September? DEAR DANA: What should I be focusing on with my futurity horse this time of the year? DEAR ANNE: Great question! At this time of year, I like to be hauling my young horses to shows and exposing them to all the different sights and sounds. Keep in mind that every horse is at a different level of training, based on (1) when he was started, (2) his own mental and physical maturity, and (3) the consistency with which he has been ridden. I do have some horses that are really slow learners – they take twice the time as others. I have others that I don’t want to push because of their physical immaturity or weakness. Dear Dana: How can I help my horse be less scared of other horses? Dear Dana: My mare is 5 years old. I was told that before I bought her she had been “beaten up” by other horses. Now I am trying to do drill with her, but she flinches and tries to get away as quickly as possible when another horse comes near her. She is so scared of other horses, even if they just look at her with their ears pinned or swish their tail. How can I break her of this? She is fine on trail rides, just as long as another horse does not turn their behind toward her. In the past, I’ve trained horses with the same problem, and I was able to get them “over it” enough to become show horses. Some of them overcame it completely, while some stayed a little apprehensive of other horses — especially if those other horses were swishing their tail or moving fast around my horse. The mare was probably the bottom of the pecking order in the pasture, and those horses can be a little more timid or sensitive. But even though we didn’t reach perfection, the horses were greatly improved. Dear Dana: Why is my horse over-bridling? What can I do? DEAR VICTORIA: A horse is over-bridling his head when he carries his head extremely bridled and behind the vertical position. When he is over-bridled the horse will often arch his neck or throat latch giving him an unnatural look. Many horses carry their head and neck this way because they are afraid or intimidated. Although I also want to stress that many times horses have learned to over-bridle, and even if you do everything right, it may have become a habit for him. It can be complicated! With more than 25 years of experience, trainer Ray Ariss has worked with riders of all disciplines and is ready to answer your questions! 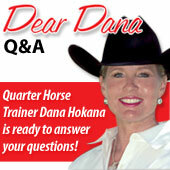 Top Quarter Horse trainer Dana Hokana is ready to answer your questions!